Not only its a flamboyant extravaganza, but would you see any one would wear it? In my opinion hope to see more of people wearing it than horrible jeans and t-shirt as they call it casual. When it comes to fiber art, Nathan Vincent doesn’t mess around. Or he does, but in a very tenacious manner. He uses yarn to create remarkable works that challenge our expectations of the materials, as well as the imagery he depicts. He does this through a cunning combination of processes, and subject matter. The processes he uses are traditionally considered feminine activities, such as: knitting, crocheting, sewing, and embroidering. The subjects he chooses are traditionally masculine objects, like: slingshots, video game controllers, and super hero capes. This juxtaposition of the familiar in an unfamiliar context is what makes Vincent’s work so striking. Last year, Vincent exhibited an extraordinary series of crocheted sculptures depicting those ubiquitous little green army men, but in this case, he made them life-sized. The exhibition was called “Let’s Play War!” and traveled coast to coast, from the Bellevue Arts Museum in Washington, to Emmanuel Fremin Gallery in New York City. Not only was this work an impressive display of his crocheting prowess, it made a powerful statement about the effect that social expectations and gender have on the way we learn to play and think creatively from a very early age. I met Softhouse in Milano and this is what they told me about one of there collections,Looking through an old family chest, they came across a wonderful collection of vintage magazines, one of which was Domus, a valuable window into 20th century design. They wanted to know everything about that world and to recreate it by revisiting its characteristic materials and finishes. They imagined it in earth y colours that create warm, evocative rooms with a Mediterranean feel. If you need any further information do please contact us. ‘F*ck the Classics’ produced some equally striking creations where very classical furniture styles were given a wacky, contemporary twist. 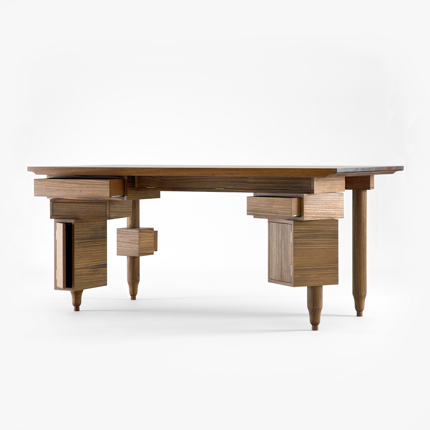 The table N7, design by Norayr Khachatryan for Casamania, is the result of a close observation of the world. The Table is a single piece of cast aluminium taking its inspiration from nature in the balance of form and function, and from the man-made world in its appropriation of a stylistic language typically associated with military engineering. Faceted and determined and at the same time functional and elegant. N7 is refers to military and aeronautical iconography. However, it was not designed for military purpose, but it”s only inspired by the military language, which is extremely functional: the form of each detail is relevant to its function, just as in nature. The complexity of the structure, its angular forms, its volumetric details resulting from a challenging construction closely linked to the use of a specific material (aluminium plate) and folding techniques. The key icon of Coates’ Scubist collection for Fratelli Boffi designer by Nigel Coates. This opulent and comfortable sofa brings timber-framed furniture into the 21st century. Its five backs are each upholstered in different colours of cotton velvet of the client’s choice, carved frame in solid walnut, seat and backs upholstered in selected fabrics. Have you seen any thing more gorgeous than this? taking about 50 shade of grey, I think grey is the new black. Top Picks: We have decided to show you a few of the designs at Top Drawer that caught our eye, and here’s the first…. 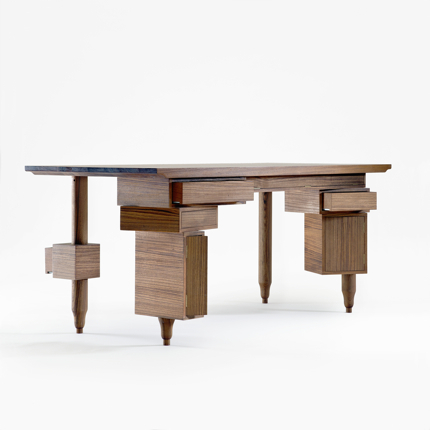 The Shuffle Table designed by Mia Hamborg by &Tradition Copenhagen caught our eye at the 95% Stand at Top Drawer. These playful tables can be reconfigured and change heights depending on how the pieces are arranged. We wanted to take a pair of the lacquered tables home to play with, but the black marble version reminds us of one of Darth Vader’s home furnishings… in a good way. 2009. She still works at the firm, which focuses on architecture and design. Her interests range from fashion design,to product design and her line of reasoning is particularly attentive to eco-sustainability; for her works she elects to use such natural materials as paper, wood, Jacroki, ceramics, glass and fabric. She registered her fashion and design brand Alla’s in 2010 She works as product designer and artist/illustrator for a number of companies in the industry, including Bosa, Okinawa, Zest design, 13Ricrea, Rivaviva, Misuraca&Sammarro, Alla’s and others. its evocative power. The shell takes on contemporary artistic value thanks to its 3D texture, whose chiaroscuro effects bring out the three- dimensionality of the surface. Designer Patricia Urquiola, With her Luna Cabinet is a friendly and unconventional addition to Coedition’s collection. With its oversized circular formed perched upon a thin, X-shaped base, the Luna Cabinet almost resembles a face, which perhaps explains the design’s appeal. But it’s not just a cute piece of furniture, it also has its function. Effectively divided into fourths, the top half of the circular cabinet space remains entirely open with a shelf for books and decoration. Sliding panels hide the two separate compartments below. The design is available in lacquered orange with Walnut doors or in Walnut with lacquered green and blue doors, both of which provide an unexpected pop of color.